Best Hair and most likely to pull someone else’s hair – Lorie from Hairspray on Main St. The Oldest Barber in Ohio (and applied for oldest in the U.S.) greeted us on Earth Day when we arrived in Defiance Ohio! Johnny Appleseed stopped by Mary Jane Thurston to see us! • Furthest identified traveler (other than the Water Crew) on the Maumee – SCAN rubber duckie from the “SCAN Duck Race” in Fort Wayne found approx. 115 miles from its launching point! Both of these amazing women and their information, will be shared and highlighted in an upcoming post…as soon as we properly apologize. Biggest Problem: Gaging “River Time” – “Exactly what time will you be there? ~ UH…RIVER TIME! Many things to consider here; headwind, stream conditions, water height & velocity, time of departure, Water Crew needs. Abigail’s Best: Having the media wait in line to talk to me! Several days, they were several deep! Began at the continental divide between The Mississippi Watershed and The Great Lakes Watershed. 20 people made the trip down the entire length of the Maumee River all the way to Western Lake Erie in Toledo, Ohio! Many others joined us for a day or two. Our group traveled approximately 15.5 miles per day & while anticipating approx. 8 hours of paddling PER DAY. 1. Assist the Upper Maumee Watershed Management Plan with GIS MAPPING with intent to assist implementation of the WMP, which will be available to the public in April 2014. Assist in solidifying specific GPS locations of straight-pipe drainage areas that are unmapped on any State or County system (i.e. tile, straight pipe, bank erosion identification, potential areas for a ‘boat launching’, large debris mapping). 2. Provide destination points to the public for outreach and education along our waterways – staging an area for experts and groups to highlight challenges, conditions and BMP’s of the Maumee River and corresponding watershed. It will provide engagement for discussions on many topics. THIS has been identified as a need for many groups. 3. Highlight U.S. Army Corps of Engineers current practice of indiscriminate vegetation removal on levees. 4. Document current conditions of the Maumee River. We will be joined by a documentarian crew and have promotion of the trip by NewsCenter 33 broadcast. Upon editing with many cameras, we will create content for our local Public Access Television broadcast in Fort Wayne. A full length documentary is being produced by Terry Doran’s, “A Theater for Ideas”. This is not a race; part of the fun is not knowing exactly the time the canoe crew will arrive at their sites! It is the responsibility of our government to ensure the safety and quality of our water, we want to help them protect our surface water for ALL. Citizens want the river usable for recreation: why is it not federal government’s responsibility, but local government’s responsibility to make them at least swimmable? Water scarcity is an issue facing us on this continent and the Maumee is the largest freshwater source in the world. See our cities and their history from a perspective you can only get from our rivers. Run, Paddle, Ride the Maumee’s Watershed! Bring back a sense of community, and show by example how-to-do-it! Reflect upon how much we as individuals can be part of something bigger than ourselves and we depend on water as all communities to make common goals successful. Upper Maumee Watershed Management Plan is due to come out in 2014 – this will improve communications with protection and stewardship and indication of goals on how to protect it. Measuring our cities progress should not be done by counting its roadways and other impervious surfaces. Need to think about sanitation – water, shelter and food as a society that will continue to feel the effects of weather systems’ change. Many resources are being spent on river management by Federal, State & Municipality & Local, yet the river is still impaired for designated use. What is the Canoe Trip about? This will be a nine day canoe trip of research and education about our invaluable rivers and streams. Our experiment will be investigating the many problems facing surface water, suggested improvements that can improve water quality and invite all groups who work toward water quality improvements to share their expertise. Simultaneously padding down the Maumee and upstream against entrenched powers and behaviors. Environmental degradation is not inevitable, even in Indiana and Ohio, with everyone working together. Fort Wayne to Lake Erie on the Fort to Port original transportation system, the Maumee River. The trip will be from Friday April 18 through Sunday April 27th, and bring people to their local riverbanks! The public is invited to Earth Week celebrations along on Maumee’s riverbanks in Indiana and Ohio. 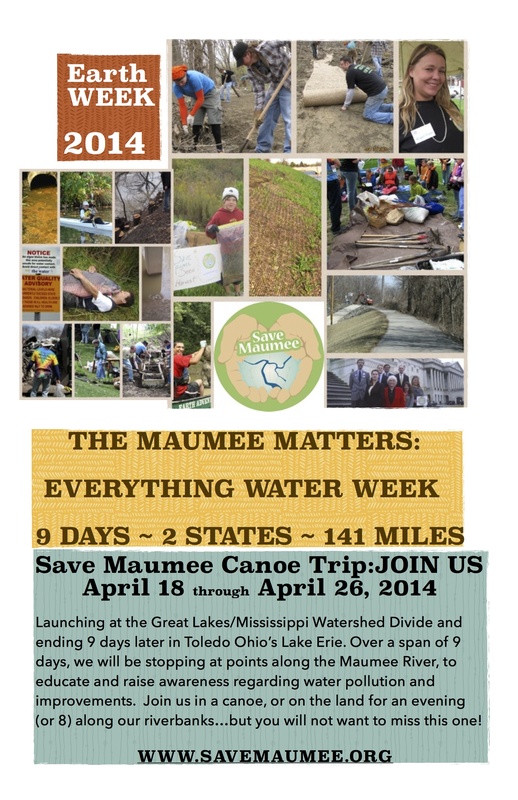 Activities and programs will occur at 9 locations throughout Save Maumee’s Canoe Trip. Their trip will start at the Mississippi and Great Lakes continental divide in Indiana and end 9 days later at the outlet into Maumee Bay’s Lake Erie, in Toledo Ohio at International Park. Activities will include GIS mapping of tiles that are not mapped on any State or County systems, water testing, garbage removal, plantings, bird and plant identification, understanding your water footprint, and lead discussions in benefits of raingardens, native vegetation, CAFO’s and animal contribution to water quality, Clean Water Act and water policy issues. These are issues the public have always wanted to know more about. Starting April 18, Save Maumee will start paddling from the area where Asian Carp and other invasive species have the ability to move from the Mississippi watershed to the Great Lakes. The canoe trip will end 9 days later at Maumee Bay in the Western Lake Erie Basin. The group will meet up on the shore of the Maumee to participate in activities in Fort Wayne, New Haven, Defiance, OH on Earth DAY, Mary Jane Thurston State Park, and International Park in Toledo, Ohio among other locations. This will be a nine day canoe trop of research and education about our invaluable rivers and streams. The groups are looking to investigate the many problems facing surface water, what could make it better, bring together all these groups, and work together to make things better for our waters. Simultaneously padding down the Maumee and upstream against entrenched powers and behaviors. Environmental degradation is not inevitable, even in Indiana and Ohio, with all groups working together. Along the way, Save Maumee will be using GPS equipment to locate tiles and drains, identify potential restoration areas and historic garbage and put them on a map…in real time. The group will also help to identify potential areas for boat ramps. All of which do not appear on current maps. The Upper Maumee Watershed Management Plan is due to be released to the public in April 2014. 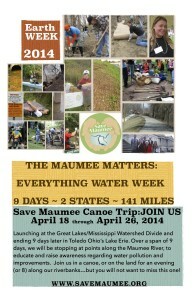 Save Maumee would like to highlight the plans and how YOU can help improve our waters all the way to Lake Erie. Among other goals, the canoe trip will highlight Earth Week and work to change the 2009 Army Corps of Engineers ruling of native vegetation removal along rivers and streams. We will report our findings and work to change public policy of ACE. The Corps currently follow “Guidelines for landscape planting and vegetation management at levees, floodwalls, embankment dams and appurtenant structures” (ETL 1110-2-571). Numerous government agencies and studies cite the importance of vegetation. The Army Corps of Engineers appear to be the only agency who does not recognize or make use of these studies. ACE requires municipalities to follow their guidelines, but Fort Wayne alone has 10.5 miles of levees next to our rivers. Riverbank Programing each evening ~ your destinations for Save Maumee’s 7 Day EARTH WEEK! LET rivers meander….come meander with us, or join us on shore at 7 separate land locations in the afternoons for Public Programing!